Vintage Postcard of Clovelly posted in 1951 from nearby Westward Ho! This charming village on the north Devon coast of England is an important tourist attraction, famous even today for its steep cobbled streets leading down to the Bristol Channel and its donkeys. The donkeys were traditionally used for carrying goods up and down the streets - today sledges do the work whilst the donkeys are free to pose for tourists' cameras! 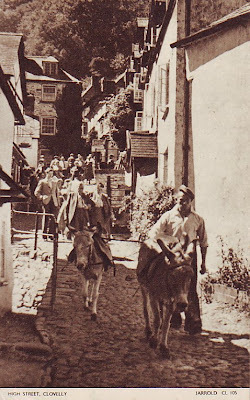 The man leading the donkey in this postcard was Gordon Perham (1920 - 1983), who became Harbour Master at Clovelly. Many thanks to his daughter for the information. I've always loved this 1970's postcard which reproduces a Bruce Springsteen concert poster. 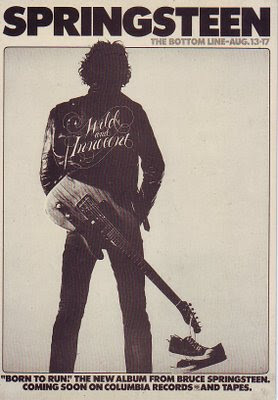 It appears to be one of Eric Meola's classic shots from the same photo session that produced the Born to Run cover – with the addition of the “Wild and Innocent” on the back of the jacket (a reference to the Boss' previous album The Wild, the Innocent & the E Street Shuffle) and a pair of baseball boots slung over the end of his guitar. It advertises a forthcoming gig at New York venue The Bottom Line and the album Born to Run. Born to Run was Springsteen's third album and was released in 1975. It was ranked #18 on the Rolling Stone 500 Greatest Albums of All Time.